HARTLEPOOL United have been beaten 1-0 by Stevenage in their opening match of the new Sky Bet League Two season. The first half was a competitive and at times feisty encounter but despite chances for either side, neither could do enough to take the lead. Stevenage had the better of the chances though and made one count on the hour mark. Chris Whelpdale’s low strike from 20-yards beat Scott Flinders to give the home side the lead, a shame for the Pools stopper who had made several smart saves. There was a late penalty shout, after what looked like a clear foul on Ryan Brobbel but it was waved away to the dismay of the Pools bench. Pools manager Colin Cooper handed debuts to Matthew Bates, Stuart Parnaby and Tommy Miller. Luke James, who is at the centre of intense transfer speculation, started up front alongside Marlon Harewood at The Lamex Stadium. 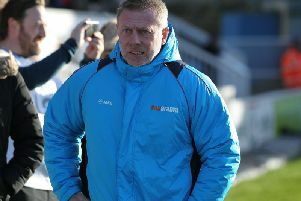 In defence, Sam Collins partnered Bates in the centre with Neil Austin being asked to slot in at left-back and Michael Duckworth in the right-back berth. Ex-Boro utility man Parnaby starts in midfield alongside Miller, with Brad Walker and Jack Compton also in midfield. New arrivals Joel Dixon, a goalkeeper signed on an emergency loan from Sunderland, midfielder Michael Woods and Ryan Brobbel, a winger signed on a months loan from Boro, are all among the subs for the opening day of the League Two season. Ex-Pools midfielder Simon Walton signed for Stevenage in the summer but was suspended for today’s match. As you’d expect on the opening day of the season both sides looked eager to get off to a good start and it was a frantic opening few minutes. The first opportunity fell to Jack Compton. The Pools winger clipping the crossbar with a lovely curled effort from inside the penalty area in the second minute. Moments later up the other end Adam Marriott forced Scott Flinders into a smart save, the short from 20-yards straight into his gloves. James suffered a heavy blow to the back of his head but was quickly back on to his feet. Charlie Lee and Darius Charles went close for the home side, the latter curling an effort just wide of Flinders’ left hand post with 15 minutes gone. Charles was able to break free after a late heavy challenge on Miller went unpunished on the half-way line. Pools, at times, were sloppy in possession against a dangerous Stevenage side who needed no excuse to bomb forward. In the 20th minute they should have taken the lead. Charles beat Bates for pace down the left-flank and passed across goal towards the onrushing Marriott. It looked a certain goal but the combination of Walker and a sliding Sam Collins denied the frontman. Pools were under the cosh but had managed to ride out a mid-half period of pressure from the home side. With seven minutes to go before the break Walker caught Lee with a high boot and the referee Mark Haywood awarded a free-kick 22 yards out. A clever routine saw Lee roll the ball towards Marriott who found himself with just enough space to toe punt a shot at goal. Thankfully for Pools, Flinders was in the right place and produced a strong block for a corner. It became a fiesty encounter as the half wore on, Jack Compton clashing with Jon Ashton and then James fell to the floor after an off the ball incident with Harry Worley at the back for Stevenage. The 19-year-old was shaking his head as he walked off for treatment but was soon back on the pitch. Duckworth broke free down the right-hand side and cut inside towards Parnaby, but his floated effort was well over the bar. It had been backs to the walls at times for Pools but they had managed to hold firm going into the break. Stevenage started the second half were they’d left off, Marriott again with a shot from distance but it was rash and well wide. Austin then had to be alert to put in a crunching tackle on the six-yard box moments later. With 55 minutes on the clock, Flinders was again called into action with an even better block than the one in the first half, this time diving to his left to deny Marriott. The Stevenage striker missing several good chances. A minute later and Flinders was again called into making a save, diving to his right but the ball wasn’t cleared by Pools and it fell to Chris Whelpdale 20-yards out. WHELPDALE’s low strike went through the Flinders who was just making up his ground and into the back of the net to give Boro the lead in the 60th minute. There was a stoppage in play after 64 minutes with Collins needing treatment for a knock on his right leg but the defender was fit enough to carry on. With 72 minutes on the clock, Charlie Lee again chanced his arm from distance but his strike whistled wide. Stevenage looked to close the game off having taken the lead. In response, Cooper moved to bring on Boro loanee Ryan Brobbel and forward Jonathan Franks for the final 15 minutes. Parnaby and Walker taken off. Pools had far more intent about them as the game creeped towards the final ten minutes. A Compton corner found Collins at the back post but his header was wide of the left post when he should have at least hit the target. It was a glorious chance for Pools to equalise. The fourth official announced six minutes of added on time at the end of the game following a couple of lengthy stoppages earlier in the half. Compton looped an ambitious volley wide in the final few minutes before Connor Calcutt struck a low fierce shot just wide of Flinders’ right-hand post. There was a late penalty shout, Brobbel appeared to be clipped by Jerome Okimo but the referee waved the shouts away. Pools (4-4-2): Flinders, Duckworth, Collins, Bates (C), Austin, Walker (Franks, 76), Parnaby (Brobbel, 76), Miller, Compton, Harewood, James. Subs Not Used: Dixon, Richards, Holden, Woods, Hawkins. Stevenage (4-4-2): Beasant, Dembele, Worley, Wells (C), Ashton, Whelpdale (Okimo, 82), Lee, Bond, Pett (Deacon, 87), Marriott, Charles (Calcutt, 78). Subs Not Used: Day, Johnson.